Message From The President | Company Data | FUJICOPIAN CO., LTD. Since starting as a manufacturer and marketer of various types of carbon paper in 1950, Fujicopian has accumulated a wealth of unique technology and established its position in the market through product development in line with market needs centered on the development and production of character and image printing recording media technology. 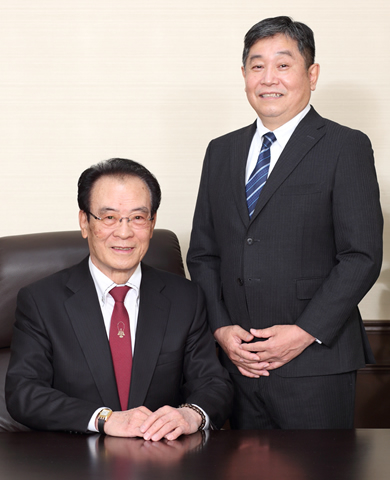 Within this process, we established ourselves as a "development-directed company" through realizing development of groundbreaking products including our world-leading thermal transfer media (non-impact type) and also our correction tape, which we are proud to say owns a leading share of the global stationary market. In moving into the 21st century, the needs of the market are increasing, changing and market globalisation is accelerating. In this environment, while developing our customer partnerships and enhancing our technological ability, Fujicopian is working to break into even more new fields through bold development of next-generation technology based on our existing unique technology. Fujicopian's future direction is as a "solutions company" which is able to plan in a timely manner according to market expectations and can move flexibly and swiftly in response to market changes. Working from this perspective, all Fujicopian employees emphasize "Speed & Action" in working hard at using technological research to create unique products with a high degree of added value, and also work aggressively to market Fujicopian's original brand. As we enter a new phase, look for Fujicopian to meet greater challenges through continued creation of unique technology and by aiming to be an organization that is second to none.